It turns out that the last Sacred Jewel fragment is in the grave of Inuyasha's father... that's the boundary between this world and the next! But the black pearl that took us to the grave has disappeared! There must be another entrance! What? I've to find this Hosenki who guards a lot of pearls? Next on Inuyasha, "Hosenki and the Final Shard". I'll make him speak even if I've to use violence! Are you happy, Tetsusaiga? It's been awhile since you've been here! Father, now I'm able to handle the Tetsusaiga very well! 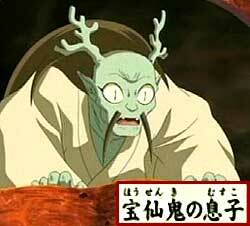 KAG: The grave of Inuyasha's father lies on the boundary between this world and the next. To find the remaining Jewel fragments, we have to search for the path that leads to the place. In the boundary between this world and the next... the statues at the Fire Gate started to move! They are Gozu and Mezu!! Only the dead can go through this gate. To pass through, you have to die in their hands. What?! Wind Scar didn’t work? They cannot be destroyed by a sword from this world! Next on Inuyasha, "The Bizarre Sentries of the Gate to the Next World". With your deaths, open the gate for me!